Three Worlds is a lithograph painting dating back to the year 1955. It is one of the most popular works of art by M.C. Escher because it provides a deep insight of different worlds. The print essentially shows a pool or lake, where one can see several leaves floating on the water’s surface. One can also see several trees reflected in the water. Thus one can get a look of the water’s surface, which is one of the worlds, as well as the ‘second world’ where one can see what lies above the surface. The ‘third world’ is the life beneath the water, where one can see a large fish swimming. The picture is truly a work of art as it makes use of true optical effects to show off the distinction between the three worlds in a subtle yet extremely effective way. M.C. 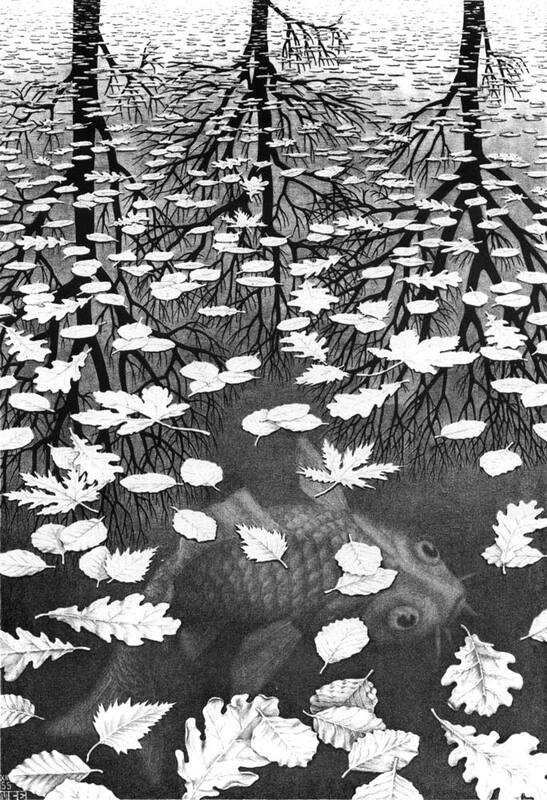 Escher also uses reflection and refraction techniques in this print.